Even in tough times, narrow aisle and very narrow forklifts continue their tradition of innovation, safety and efficiency, as Melissa Barnett reports. Warehouse storage and its materials handling support systems have looked for ways to improve their bottom line for decades. Narrow aisle forklifts and their smaller cousins, very narrow aisle (VNA) forklifts, have been specifically designed to meet the trend of increasing storage space density by reducing aisle width. The specialised materials handling equipment is designed to work in increasingly narrow aisles between warehouse storage bays. Conventional aisles are around 3.8 metres (12 ft) wide, narrow aisles can be around 2.5 metres (8 ft) wide and very narrow aisles are those under 2.5 metres (8 ft). The first narrow aisle forklift was designed by Christian Gibson of the Raymond Corporation of America and manufactured in 1949. Raymond called it the straddle stacker and by 1953, Raymond had produced 1,000 of the new trucks. By the 1970s, in response to the construction of larger warehouse storage facilities, the increased use of high bay racking and mechanised stock picking, a range of machine types was made available. The increasing cost of floor space encouraged warehousing operations to push racking closer together, increasing the need for narrow and very narrow aisle forklifts. There are essentially three types of forklifts designed for use in narrow aisle and VNA applications: reach trucks, turret trucks or stackers and order pickers. 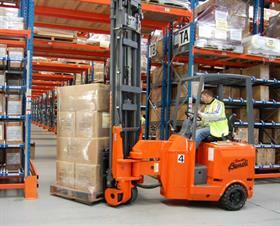 Reach trucks are characterised by hard plastic wheels and are manually operated. They generally move between the loading bays and the storage aisles, placing stock pallets at low-level picking height. Turret trucks and order pickers are considered very narrow aisle machines and generally have forks mounted on a turret which allows them to rotate to access storage bays on either side of the aisle. In "man-up" configurations, the operating cab is attached to the turret to allow both stacking and order picking. The turret can be raised to as high as 15 meters. Order pickers, as their name suggests, allow workers to pick up small order units from storage and take them to wherever they are needed. Due to the narrowness of the operating space and for safety reasons, these VNAs are usually steered automatically along guide rails, wire guidance systems or transponders when operating within the storage aisles. Once outside the aisles, they can be manoeuvred manually. Until the 1990s, most warehousing operations used a combination of equipment types - traditionally a counterbalance forklift for outside work, typically unloading stock; a reach or turret truck inside the warehouse for stacking pallets and an order picker for collecting the stock units and delivering them to the production line or transfer point. This combination is used in many warehousing operations today because efficient storage configuration is still largely dependent on forklift interaction, particularly as the equipment used has very specific functions. However, such equipment-intensive combinations are becoming expensive and not always the most efficient. 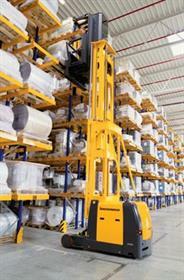 In 1990, Fred Brown of Translift designed an articulated forklift which changed the face of narrow aisle handling. 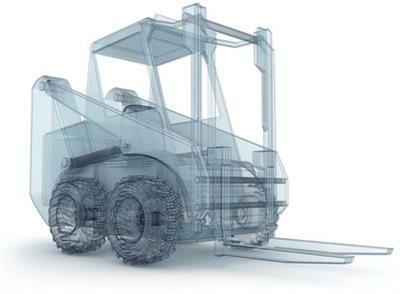 Subsequently, a number of materials handling manufacturers have designed hybrid machines which can do the job of both a counterbalance forklift and a reach truck. Articulated forklifts such as Translift’s Bendi, Narrow Aisle’s Flexi and Aisle-Master can operate in narrow aisle configurations of less than 2 meters, lift pallet loads to heights of up to 12.5 meters (41 Ft) and offload stock in the loading yard. The articulated design enables the operator to drive to the centre of the pallet required, turn the steering and mast through 90 degrees and then drive directly into the pallet. The operator then simply reverses out while unwinding the steering wheel. Both Simon Brown of Translift Bendi and John Maguire of Narrow Aisle point out that articulated forklifts have been more readily accepted in non-traditional materials handling markets such as Eastern Europe, the Middle East and Africa. "Markets that don’t have preconceived ideas and are quick to adapt to new technology," Macguire says, adding that Narrow Aisle recently delivered two G4 articulated forklifts to West Africa. Addax Petroleum acquired the forklifts to handle spare parts and consumables used in the oil and gas exploration work undertaken by the company throughout Nigeria. Space is limited in the warehouse and currently all palletised loads at the site are block–stacked, mainly because Addax faced difficulty in finding a local heavy-duty racking supplier. The Flexi trucks were chosen because they allow pallets to be block-stacked more closely together in the Addax warehouse than the traditional counterbalance forklifts the company was using, according to spokesman Colin Mead. Mead explains that using the articulated forklifts has saved Addax floor space and will enable it to store even more product once its heavy-duty racks are installed. 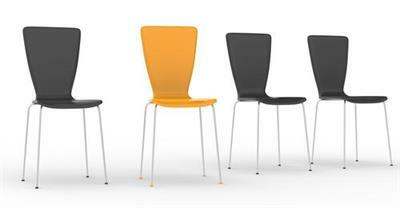 Innovation is often driven by both safety and efficiency concerns. It is also driven in the narrow aisle and VNA sector by the enormous range of applications and working conditions that the equipment encounters in daily operation - from toys to aircraft parts and freezing storerooms. As Ron Farr, VNA product manager at NMHG – Europe, points out, some of his customers don’t even use racking. 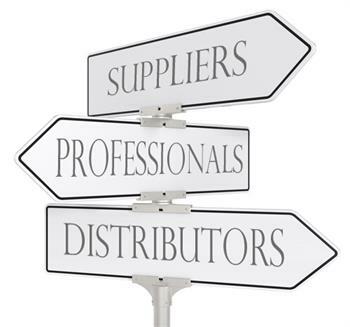 "We have customers with only one aisle or customers with extremely low racking… (We) handle whiskey barrels, furniture, frozen foods, paper rolls - the applications are numerous." The common denominator in narrow aisle innovation is the need to minimise stock damage while maximising speed and safety. One way of doing this is to control the speed and direction of equipment in the aisles. Guide rails and wires such as Raymond’s Intelliguide digital wire guidance system do this by providing automatic tracking and stability - and automatic stopping at aisle ends. Jungheinrich first introduced its RFID warehouse navigation system on its Stacker EKX at CeMat 2008. This system uses transponders installed in the floor of the warehouse which communicate with an RFID reader and writer, according to Sebastian Riedmaier, warehouse and system technology product manager. 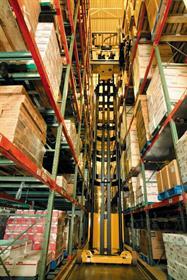 The system identifies which aisle the stacker is in and references the distance measurement of the stacker. Safety and efficiency can also be enhanced by automatic rack selection. Available on most new-generation VNA equipment, rack selection allows operators to stop the forks at a specific rack level. Sensors detect that the truck is carrying a load and adjusts rack entry height accordingly. Rack selection can also be fully automated from the warehouse management system, reducing driver time and misplaced stock. However, the most important innovations for narrow aisle and VNA forklifts have been the ones that combine safety and efficiency with green solutions, such as regenerative braking, regenerative lowering and improved AC electric technology. Regenerative lowering is available on Hyster’s ZR and Raymond’s 9000 series Swing-Reach. "Regenerative lowering recharges the battery when the forks are lowered, which allows for longer battery life," says Susan Comfort, Class II product manager for the Raymond Corporation. Manufacturers globally, whether they want to or not, are turning their attention to reducing the impact their machines have on the environment. John Maguire, sales and marketing director for Narrow Aisle Ltd, says there is less demand for LPG-powered units, due to CO2 emissions and high energy costs. He says there is increased demand for the latest intelligent chargers and many of Narrow Aisle’s customers are taking the greener option. "They cut the charge time down to as little as two hours and can save up to 30% of traditional recharge costs."